Some of Stamford AFC’s under-performing players are living on borrowed time. Manager Graham Drury could have up to three new players in his squad for the Evo Stik Northern League Division One South clash at Romulus tonight (December 13). Billy Smith (red) scored for Wisbech in their 3-0 win over Kirby Muxloe at the weekend. Drury was appalled by his side’s display in a 3-0 defeat at Kidsgrove on Saturday (December 10), a result that left his side languishing in 18th place. 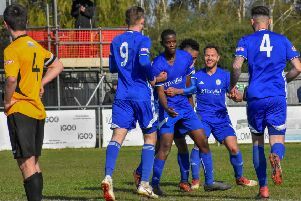 It’s been a disappointing league campaign for a Daniels side expected to challenge for promotion following their relegation from the top-flight last season. The team’s heroics in the FA Cup, as they reached the first round proper for the first time in the club’s history, will soon be forgotten if league results don’t improve. In contrast Wisbech Town are in terrific form and they will be confident of securing a seventh win in a row in all competitions when they host Boston Town in the United Counties Premier Division tonight. A win for the Fenmen would take them up two places to eighth. Boston are currently next-to-bottom with just three wins from 23 matches. Wisbech Town v Boston Town.